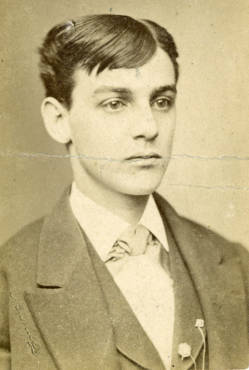 Biography & Genealogy: John Loney, Class of 1873: Genealogy: Born- Sept. 11, 1852 in Baltimore, Md. Father- Francis B. Loney; Mother- Anne E. Keller. Pat. Grandparents- unknown. Mat. Grandfather- Christian Keller; Mat. Grandmother- Ann Maria Kraber. Married- Gertrude Holliday on Jan. 4, 1899. No Children. VMI Record: Entered VMI Sept. 1, 1869; Graduated July 4, 1873 ranking 34th in a class of 51. Careers: Merchant; Representative at U.S. Fidelity & Guarantee Co. Died- Feb. 22, 1932 at Edgewood Sanitarium, Baltimore, MD.